Titles are supposed to be a teaser of the content within, & I know, the title of this post really gives it all away. But come on, did it not catch your attention? Did you not read it & think, "God, Kate has all the weirdest stories"? Let me back up. I have basically been too busy to breathe lately, & when I'm not busy, I'm relaxing as much as humanly possible, because I seem to be very all-or-nothing these days. I worked 18-hour days at my organization's major biennial convention (this was my fifth one with them! ), & when I got home, I slept for 18 hours. That basically sums it all up. But while in Orlando for that very-busy convention, I still had the opportunity to squeeze in a couple little adventures. My job at this event, as is my job in everyday life, was to maintain our organizational social media presence - tweeting, posting to Facebook, blogging, etc. On-site social media is a lot of fun to do, & I love the fast pace of it. I confess that I also love sitting backstage at our big plenary sessions, watching what goes on behind the scenes & seeing all the VIPs walk by, practicing their speeches. One of our plenary speakers with New York Times columnist Nick Kristof, an incredible advocate for global human rights, including women's rights & health issues. Winner of two Pulitzer Prizes, he's renowned for writing that gets people to pay attention to & take action on global crises. 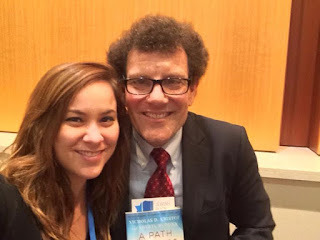 I bought Kristof's book after the session & stood at the end of the autograph line. With no one behind me, I shamelessly asked him for a quick selfie. He was kind enough to oblige, & it was only mildly awkward. I figured he'd be my only brush with celebrity during the week, as I rarely get to meet them while sitting backstage in the dark - but just being there, live-tweeting, is enough of a rush. Our final speaker was a heavyweight keynote - Vice President Joe Biden! Late Sn Saturday night, I settled in for the long haul backstage with a trenta latte & a bottle of water. But there was a problem. I have a pea-sized bladder, & I soon discovered that my reliable backstage bathroom was closed - because, you know, the veep rolls deep with a squad of Secret Service folks. Long before Biden's address even began, I found myself nearing uncomfortable liquid levels. I contemplated my options: Run to the far-away hallway bathrooms, missing live-tweeting opportunities? Or... ask the nearby Secret Service dudes for help? I chose the latter, timidly approaching the three burly, suited men who guarded the room where the VP awaited his stage debut. "Hi, uhhhh," I started brilliantly. "I really have to use the bathroom, but just realized I can't get to the one backstage..." Nothing like rambling to make your point. ...filled with massive, shiny, black presidential vehicles being hand-polished by more men in suits. Indoors. It was like some scene out of a movie. The vice president's address began as soon as I got back to my seat - whew it! I settled in & took to social media to live-tweet his speech & interact with audience members who were doing the same. As Biden spoke, my boss approached me in the dark. "Would you like to meet the vice president?" he whispered. I wanted to keep my cool & be a professional, but instead I just smiled like a dope & uttered, "Yes!" When the VP exited the stage, he & his entourage made their way toward the backstage doors - but not before my boss diverted him toward where I stood with a few coworkers, watching expectantly. "Is this your staff?" Biden asked, walking toward us. He started with others, asking their names & hometowns, bantering about sports & kissing one of my coworkers on the head. He was in a hurry by the time he got to me, shaking my hand & starting to move along, when I basically sort of blacked out & acted on an idea. "Mr. Vice President," I piped up, his staff & my coworkers all turning toward me in surprise, "I run our social media feeds. I wondered if I might get a selfie with you for the big screens?" 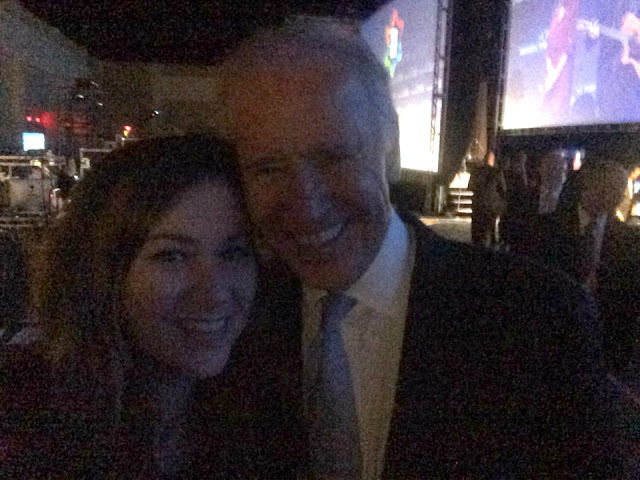 That's when Joe Biden, vice president of the United States of America, gave me a good-natured laugh & flung his arm around me, smiling for a series of three dark, grainy selfies as a dozen expectant staffers looked on. And then he gave the rest of us a wave & swept away, headed off to be... you know, the vice president of the United States of America. And that, my friends, is the story of the time the Secret Service escorted me to the bathroom & then I took a selfie with the veep. Did the title blow the story? I hope not. Because it's one of my new favorites.